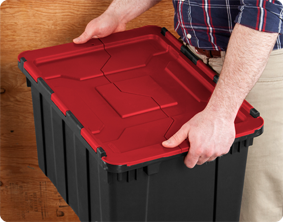 Bring order to garages, basements, and attics with the rugged design and unique features of the Industrial Tote line. 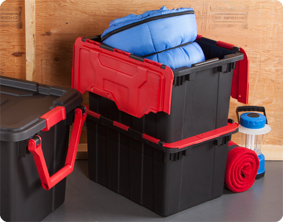 Be confident that stored items will stay protected in the durable 12 Gallon Hinged Lid Industrial Tote. The attached hinged lid allows for easy access and ensures that the cover is never misplaced. The lid design allows for a zip tie to be used to keep the lid securely closed while transporting. The secure stacking feature maximizes vertical storage space and channeled walls provide added strength. Integrated, contoured handles make lifting and carrying easier. 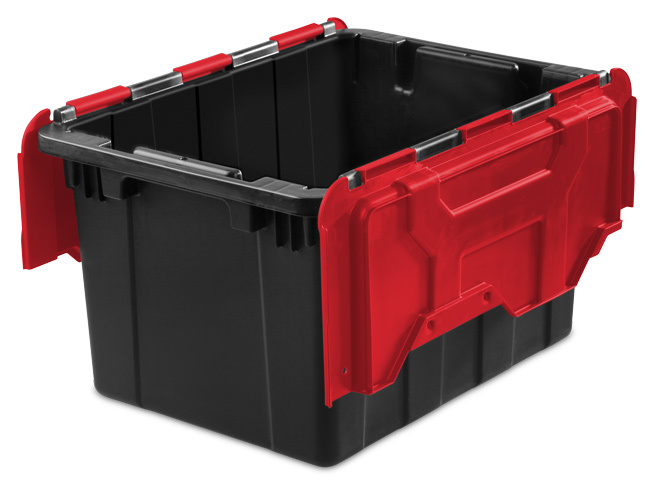 The 12 Gallon Hinged Lid Industrial Tote is the ideal all-purpose solution for active storage needs, store sporting goods, lawn supplies, household essentials, and camping gear. The overall assembled dimensions for this item are 21 3/4" x 15 3/8" x 12 1/2". Overall Assembled Size: 21 3/4" x 15 3/8" x 12 1/2"
Integrated, contoured handles make lifting and carrying easier for transporting. The convenient attached hinged lid allows for easy access to contents and ensures that the cover is never misplaced. While closed, the lid allows for efficient stacking to maximize storage space. 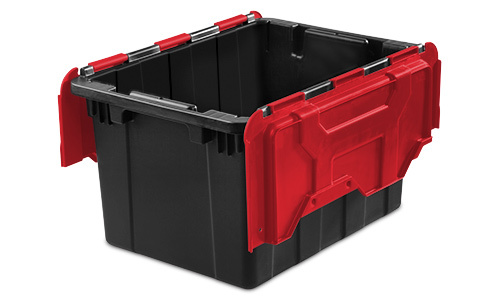 12 Gallon Hinged Lid Industrial Tote is rated 3.5 out of 5 by 2. Rated 3 out of 5 by Cal from Lid not stable The size is great. The straight sides are great, but the flop together lid is not stable. The lid buckles under pressure, and is difficult to weave together when closed and does not lay flat when closed together. I received the product in exchange for my review. Rated 4 out of 5 by Joanlukach from Garage Storage This tote is a good way to store all of my weed and feed, rose food, and other fertilizer related products in my garage.